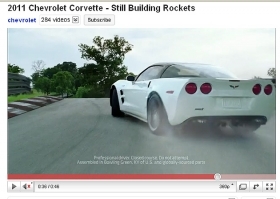 GM aired a spot on ESPN this summer for the 2011Chevrolet Corvette. DETROIT -- General Motors Co. nearly doubled its advertising spending in the first half of this year, leading a rebounding auto industry's marketing push, ad-monitoring company Nielsen Co. said. In the first half of 2010, the auto industry spent $3.5 billion on advertising, up 27 percent from the year-earlier period, Nielsen Co. said in a recent study. Nielsen didn't give a total for GM's ad spending, but it said the total had surged 95 percent from the year-earlier period. In the first half of 2009, GM was preparing for bankruptcy, and industrywide sales were plummeting. The automotive industry led the top 20 product categories in U.S. ad spending in the first half of 2010, Nielsen said. It also said that more than $42 million was spent in the United States advertising the Chevrolet Volt and Nissan Leaf alone. GM ran a 30-second teaser ad back in July to prepare for the Volt's release in November. In preparation for the December release of its first all-electric vehicle, Nissan began running ads via Apple's iAd in September featuring a polar bear that hugs Leaf drivers. Advertising Age, an affiliate of Automotive News, says those ad campaigns as well as upcoming campaigns from BMW AG, Coda Automotive Inc., Fisker Automotive Inc. and Norway's Think are also using social media to create a fan base for planned electric vehicles before those vehicles hit the market.